I have caught the cycle touring bug. But there is still lots to learn and experience. Last weekend, I set off for my first, short, solo cycle tour. 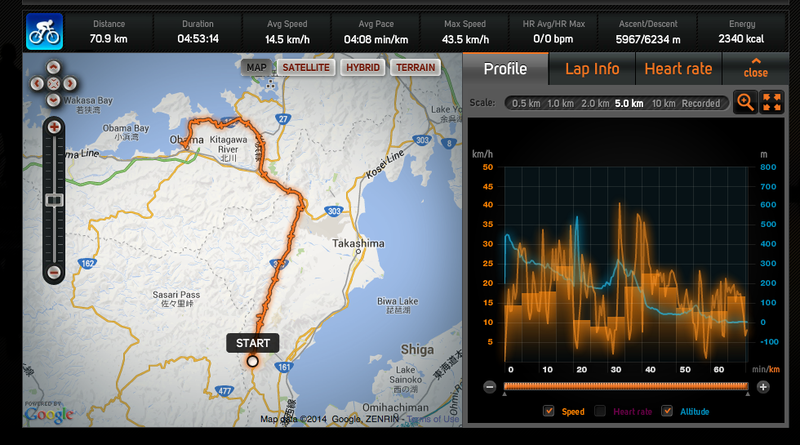 The plan was to leave Kyoto Friday afternoon, cycle to the norther coast and back on Sunday. This trip had several purposes, other than to just get away for a bit. I wanted to test my new bike and panniers under a loaded condition. 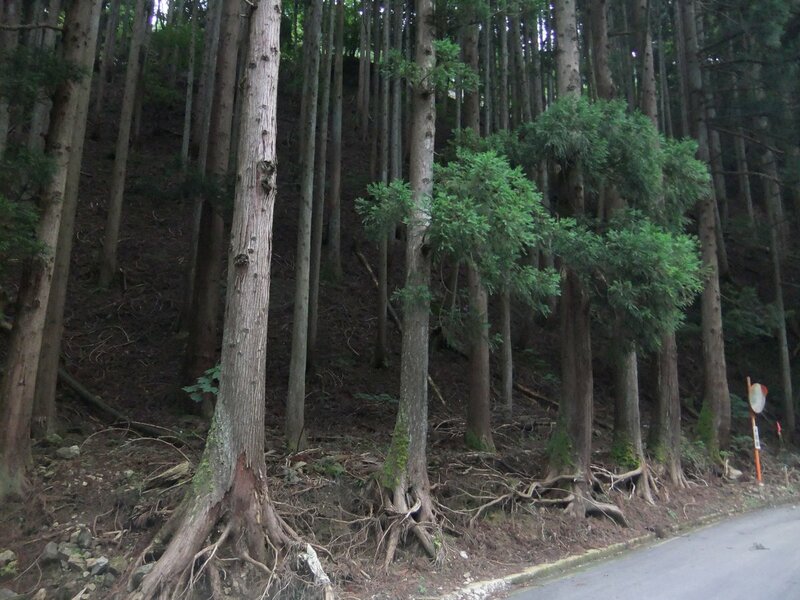 I also wanted to see how it would be to camp in Japanese forests. The trip took 2.5 days. Friday evening after school, Nate and I rode up to Ohara. 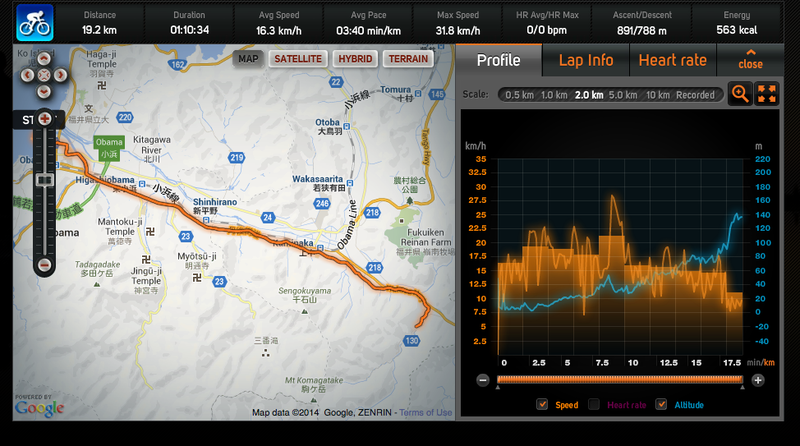 Nate had to get back to Kyoto so I rode on for a while until I got to my targeted campsite. There was a big climb and a tunnel but I found my target place with no problem. There was a nice stream and a concrete structure half-way up the hill to sit on. Friday evening. Kyoto to first campsite. The night was very calm. No cars. I heard some animals, but nothing came to close. In the morning, I made a nice coffee. Ate my bread. Packed up and hit the road to Obama. The road followed a nice mountain valley. 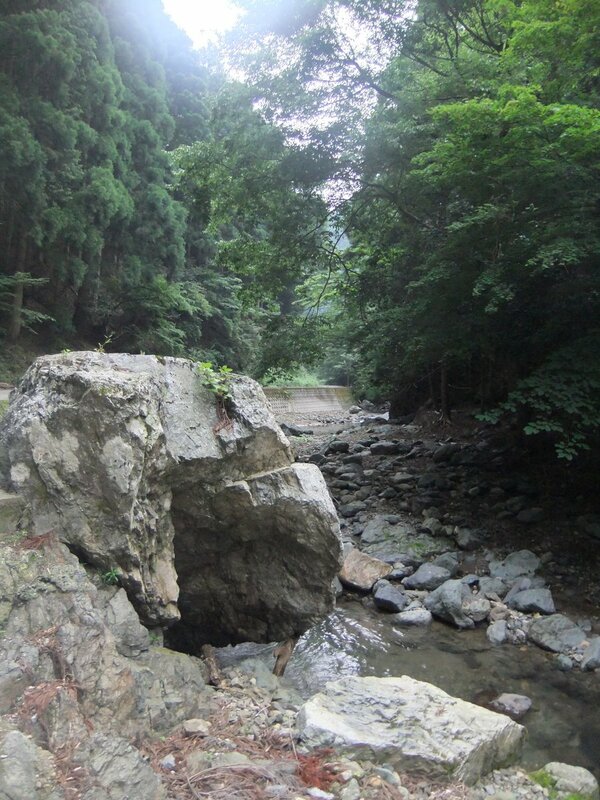 Sometimes I could cross from the main road and ride on the opposite side of the river without traffic. The small farm towns were lovely and there were loads of guys fishing in the river. There was a pretty big climb to cross the continental divide and start the descent into Obama. My new bike does not have the same low gears that the Gary Fisher had. May need to swap out to some lower gears to climb better. My skinny legs don’t play that game! In some places, the road got narrow and the trucks got big. At times, it kind of sucked. At other times, it was magnificent. I tried to get off the main road and follow a smaller parallel road to Obama but ended up in a side valley. Rather than go back, I kept going to the coast and was rewarded with some great views of little coves and the rugged coastline. There were three tunnels but they all had nice, wide sidewalks. One even had a railing! When I finally reached Obama, I was tired, hungry and smelly. I set off looking for a public bath but only found a foot bath. After riding around, searching some more, and asking at a convenience store and at the town visitor information, I found out that the sento was right next to the place with the foot bath! Ha ha. So I paid my money and had a lovely shower and a soak in a hot bath of medicated pink water. They had a nice little cafe and I had a bowl of tempura and rice and charged my phone. Public art at the fish market. Foot bath! Felt good but I wanted to submerge my whole stinky self in there! The ride back over the hills on Sunday was on my mind and I still had some time, so I rode out of Obama, back up the hill to get a head start on Sunday. I managed 20 km out of town and found a quiet little forest road with a stream to hang my hammock. Sunday morning I woke up to a light sprinkle. I managed a quick breakfast and packed up in the rain and set off for the climb. 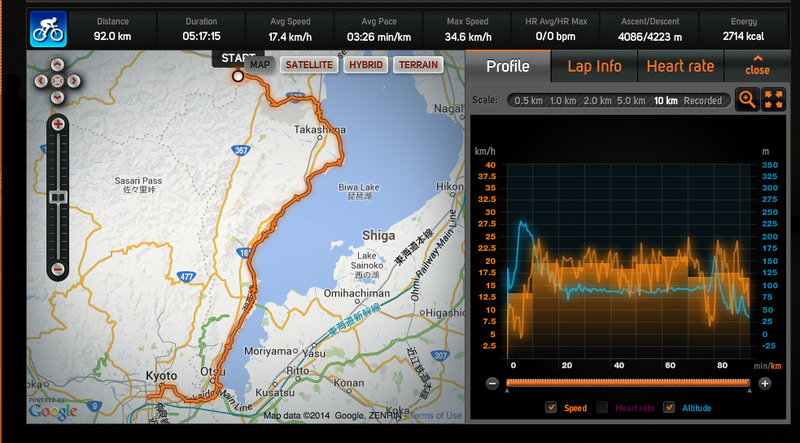 It wasn’t as bad as I expected but it rained and rained and rained all the way over the hill and down to Biwa Lake. I rode along the lake for a few hours until I came across a nice little hut by the lake and stopped to make tea and have a snack. The rain stopped but the clouds stayed for the last push along the lake shore to Otsu town. I stopped for a traditional Otsu hotdog (or 2) before crossing the last 2 hills back into Kyoto. 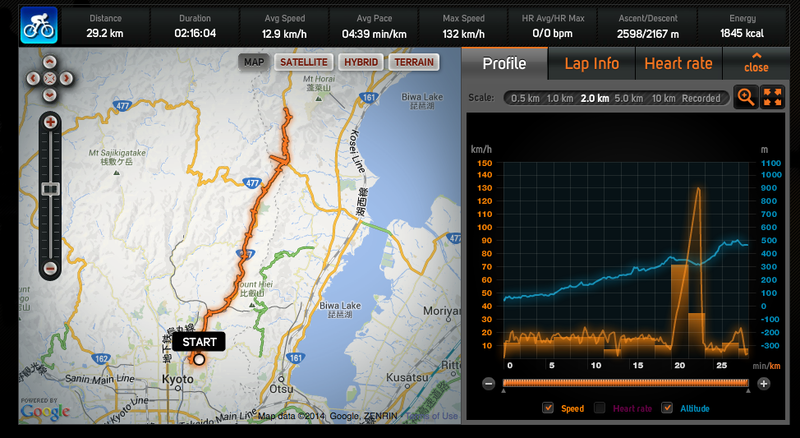 The whole trip was 220 km and I rode farther than expected on Saturday and Sunday. My shoulders hurt at the end but learned some good lessons about myself, the bike and the camping. Sunday’s ride in the rain. Over the hills, to the lake and along the lake shore. Can’t wait for the next trip! This entry was posted in Cycling, Japan and tagged bike touring, Japan, Obama, Ohara, Otsu. Bookmark the permalink. First solo! Did you enjoy it… They say if you want to travel fast ride alone, but if you want to get far travel together!